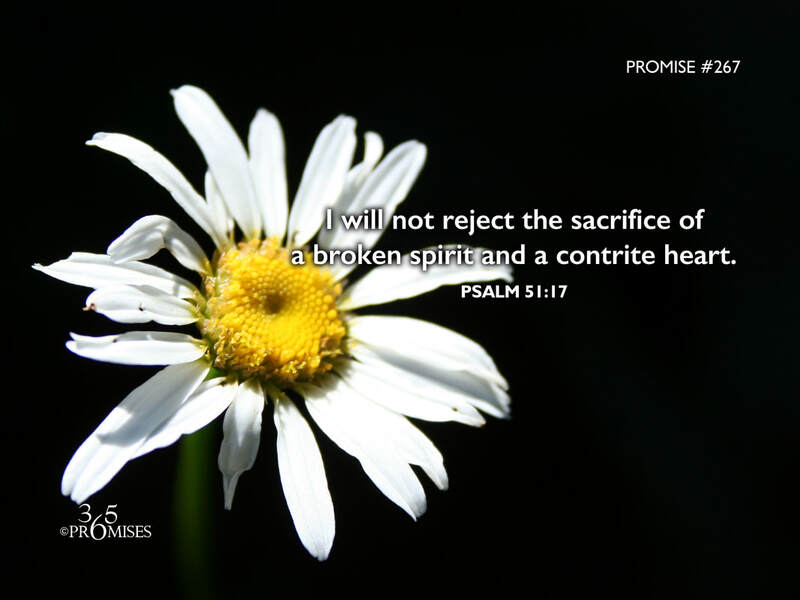 I am so thankful that the sacrifices that God accepts are those of a broken and a contrite heart. Psalm 34:18 says... The LORD is close to the brokenhearted and saves those who are crushed in spirit. (NIV) When we are feeling the farthest away from God, He is actually the closest to us. He does not abandon us in our times of crisis for He has promised to save us even in our darkest time. King David wrote this Psalm after it became public knowledge that he had sinned with Bathsheba. His illegitimate affair caused a world of hurt and pain for many people. It was at David's lowest point, that he had a revelation of God's love and mercy. Perhaps David expected God to reject him for his sin? Perhaps he was surprised to feel God's nearness in the midst of his darkness? Whatever he felt, he knew that the Lord saw his broken heart, and God knew that David was truly sorry for his sin. For many of us, when we sin against God, we run in the opposite direction of Him assuming that He will turn away from us. The opposite is true! When we are at our lowest point, He is very close to us and He promises to save those who are crushed in spirit.